There are millions of tools – free, free to try and paid – anyone can use for web design. I would like to share the ones I have used till date. 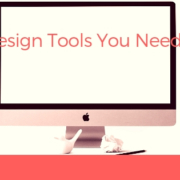 Here are the the 5 web design tools you should be using for awesome web design work..
It’s a very heavy studio but the tools you get to work with can make your designs go from “hmm..” to “wow!”. I use Photoshop and Illustrator a lot, but truth be told, I am more of a Photoshop person than Adobe Illustrator. I use both mostly for logo design, or for a simple task of getting the hex code for hues and shades I like to incorporate in my designs. I’ve started using Photoshop for some basic animation stuff too, so it’s a go-to design studio for any type of graphic work. What’s web programming without a text editor, right? My weapon of choice for a text editor is TextWrangler. The best part about TextWrangler is you can have multiple files open at one go, and you can switch back and forth between files. It has all the functions of a regular text editor, plus all these other functions that make it really user-friendly. I’ve been using TextWrangler for as long as I can remember, but at the time of this post, the product website said they are shutting it down soon. Though the sunset date is not mentioned, I’ll keep on using it till I can. When I first started designing websites, I was told Mozilla Firefox is THE browser to check your website’s rendering, that is, the way your website will look live. However, a few years later, I eventually realized Google Chrome is much better. If your website works well in Chrome, it’s a sure thing it will work in other browsers too. Open your HTML file locally on Chrome and right click to “Inspect Element”. Any element. And if there are no errors listed, you’re good to go. If not, fix the errors which are listed specifically. No guesswork. If you are not into creating images for your website but would like to use high-resolution images, totally free of charge, try https://stocksnap.io for beautiful free stock photos. Images are added every week, and there is absolutely no attribution required. You are free to use these images whenever and wherever you like. You can even sign up to have images delivered to your inbox. Isn’t that cool? Microformats are a way to make your web pages readable by other computers and those spiders sent by search engines to “read” your website. It’s basically behind-the-scenes codes that you add to your HTML, which make no difference to your design whatsoever, but will do wonders for your website in the long run. Imagine, a little bit of code specifying the business address on your contact page can actually enable Google Maps or Google Earth or any address book program to pull it up and display it directly without any extra code from you. Alternative can be Schema.org or the Google Structured Data tool in Google Search Console. These are the 5 web design tools everyone in web design should be using. If you search for web design tools online, I’m sure you will get to know other very good tools too. But these are the ones I love using for my web design work. So try it, maybe one or two (the whole lot!) will stick, and you would also start feeling incomplete without these tools open on your workstation, like I tend to do. Are you using these tools already? What else do you use? Tell us!